Is there anything you’d like to change about your life as a caregiver? If you’re like most people, you can come up with a pretty good size list in no time! If you’ve been thinking about how to make changes it can seem overwhelming – with all of the many challenges you’re facing, where on earth do you start? “I’ve been my mother’s primary caregiver for over 10 years. I’ve been happy to do it for most of that time, but recently it’s gotten much more challenging, frustrating, and upsetting. I’m still committed to being her caregiver, but now I need help. The problem is, the rest of my family members are always critical of my decisions, so they’re not likely to be willing to provide the kind of support I want them to. To make matters worse, my mother no longer acts or sounds appreciative or grateful for all my sacrifices – so I’m constantly feeling sad and dismissed…or even angry and resentful when the pressure gets to be too much. I am sure that you do need help, since you’ve been immersed in caregiving for a very long time. Given that you haven’t asked for help before, it’s not surprising that you are not quite certain what help you want or need. I’m certain there are many possibilities that would prove to be beneficial to you. 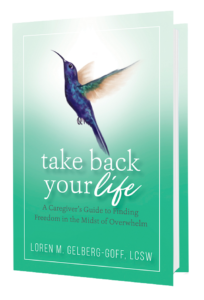 The purpose of the Caregiver’s Step-By-Step Guide is to provide you with a system for gaining clarity in the midst of the chaos that often comes with the overwhelming responsibilities of caregiving. Chaos occurs not just when there is too much to do, but also when you experience too many thoughts, feelings, unfulfilled wishes and unmet needs – including, most importantly, your wishes and needs! The Guide is designed to help you address each challenge in your life individually, whether they involve your job, spouse and children, community commitments, parents and siblings, or demands from the person you are caring for. You take each issue one step at a time, get in touch with what’s most pressing for you regarding that challenge, and figure out what you really want and how you’d like that challenge area to change. A very important part to your question has to do with what to change first – something big, or something small? My answer is: both! But before you start to feel overwhelmed, keep reading…. Start by asking what your biggest source of stress and upset is. In your case that could actually be your feelings about your mom no longer expressing her appreciation – it’s important to look at that, since it’s all too easy to gloss over just how much that can affect everything else you’re trying to accomplish. The first step in the Guide is to sit with awareness of your feelings. Allow yourself to focus on what is most challenging, frustrating and upsetting. There are no judgments, simply awareness. Lay out, in writing, what your most pressing issue is at the moment. What is interfering the most with you being able to feel happy, fulfilled or just content in any given moment? Many situations cannot be changed, but we do have the ability to change how we view them and how we choose to handle them. Shifting your perspective on a big problem, and being willing to consider that there may be other options for dealing with that issue, can significantly improve your ability to handle it. Albert Einstein once pointed out that we cannot solve our current problems with the same thinking we used when we created those problems. So – YOUR BIG MINDSET SHIFT COMES FIRST! This is where your power lies in making all other changes. Use the Steps in the Guide to shift your thinking first. 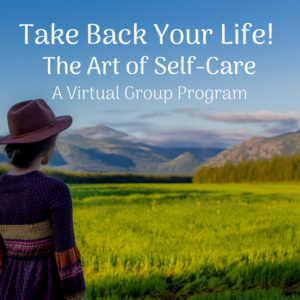 Then go back and use it to examine your habits in how you’ve been handling your caregiving responsibilities, and dealing with the particular pressures, stresses and conflicts related to them. What do you think? What do you say? What do you do? Which of those actions you’ve been taking, day after day, actually could be traded in for some new, more effective options? That’s where the small changes come in – start with something that feels doable. Feeling confident and compassionate enough to make one small request of a family member, and being unattached to whether the answer is yes or no, is a great example of a big mindset shift followed by a small change in the action you choose to take. Even if the answer is “No” the first time you try, that doesn’t mean you have failed, or even that the answer might not be “Yes” next time – or that there isn’t an even better option, as you Step around the next corner, for solving that need. Follow this same process for each challenge or situation that you want to change. The Caregiver’s Step-By-Step Guide doesn’t give you specific answers. It is a resource that can help you shift your perspective and your thinking. Whatever help you decide to ask for will be the end result of the Steps you have taken to explore your awareness of how you have been reacting to what stresses you. Do not rush the process. Breathe, and allow yourself to be open to new ideas and possibilities, even if they seem impossible to achieve at this moment. Use the Guide to literally take one Step at a time. As Martin Luther King, Jr. said, “You don’t have to see the whole staircase, just take the first step.” You may not know today what help you need – but if you take time, and allow yourself the time and focus to use the Guide, I trust you will discover your answers. If you would like some one-on-one support, find the link in the center of the Guide and use it to arrange a complimentary consultation with me. Together we’ll find some specific new options for your particular situation.